WebNMS SNMP Agent Tester is a comprehensive toolkit for testing SNMP-based agents. It provides support for SNMP V1, V2C, V3 (USM), Trap testing, compliance testing, vulnerability testing, performance testing and stress testing for agent developers to test their agents. The TCL Test Engine offers a scripting interface that helps users to customize testcases, and use them for regression testing. It can rapidly be done using intuitive GUI. WebNMS SNMP Agent Tester is a poweful test toolkit for SNMP-based agents. ...... the agent within minutes. Apart from tests conforming to the standards, Agent Tester allows you to build your own test cases according to the behavior of the agent. 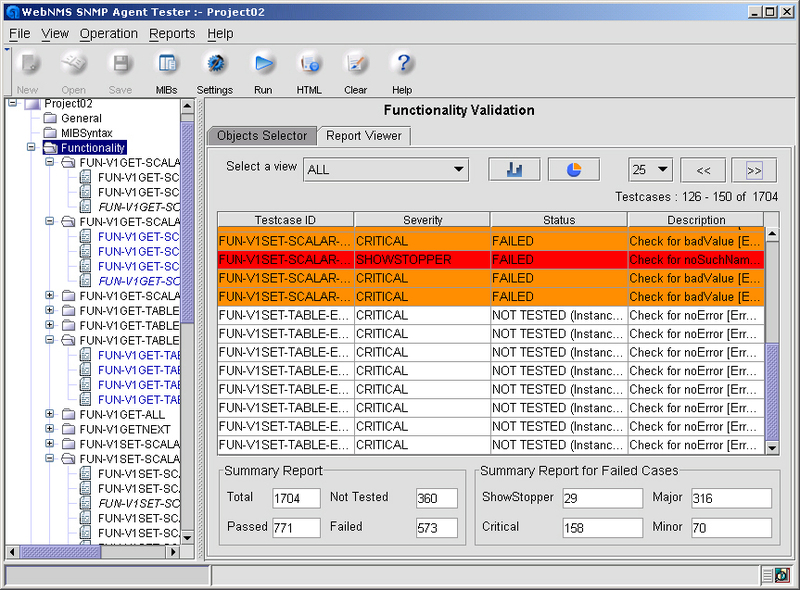 WebNMS Agent Tester can rapidly be done using intuitive GUI. Agent Tester saves the testing effort and time dramatically. Agent Tester empowers the agent developers and product quality assurance engineers to improve the quality of their product, and enables the end users to verify whether the product is standards-compliant, before deploying it on their network. Qweas is providing links to WebNMS Agent Tester 4 as a courtesy, and makes no representations regarding WebNMS Agent Tester or any other applications or any information related thereto. Any questions, complaints or claims regarding this application WebNMS Agent Tester 4 must be directed to the appropriate software vendor. You may click the publisher link of WebNMS Agent Tester on the top of this page to get more details about the vendor.